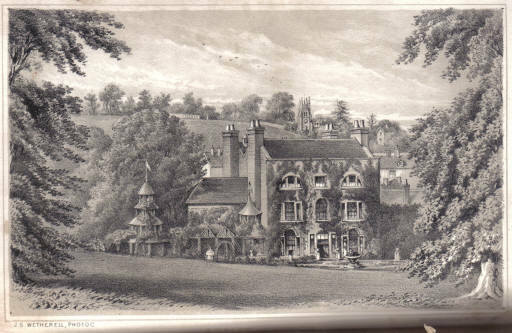 In 1856, a Dr. James Williams, who had moved to Aspley Guise in 1849, issued a book proclaiming that Aspley Guise and district was the ideal place for anyone suffering from Consumption (or Tuberculosis as we know it now) to live. He compared the local climate and rainfall to a selection of national and international resorts and concluded that Aspley Guise beat them all for having the qualities most suited to restricting the advance of this (at the time) common condition. The effect that Dr Williams’ little book had on our local district was vitally important. His advice that speculators should snap up building ground to erect residences was gladly taken up by many entrepreneurs, who were keen to ride the tide of the new healthy-living Victorians. Medical and scientific advancements were being made daily, and such a well-reasoned, evidence-based argument, put forward by a reputable Doctor, was eagerly seized upon. 1860 – 1890 saw a period of unrivalled development in our district. As well as attracting private builders, it also led to several convalescent hospitals being built on Aspley Heath. The area then attracted many tourists, who came to ‘take the healthy airs’ of Woburn Sands, by walking in the woods, where the pine trees were said to contribute to refreshing the lungs. All these visitors needed services and shops, so the local economy flourished, with tea shops, boarding houses and souvenirs etc. From being the ‘terror of travellers’ of the 18th century, Woburn Sands had developed almost a spa-type reputation by the end of the 19th. Quotes from the book were used by local estate agents in their house sale portfolios and hotel keepers used it in advertising. This period of promotion lasted right up to the First World War, after which things would never really be the same again…. I cannot comment on how correct Dr Williams’s conclusions were, nor his measurements of weather regarding Aspley Guise. But I am grateful he took the time to promote his new home in such a way that many new people and new money was attracted to the district. Without him, things may have been very different in our sleepy little villages…. This particular book is a second edition from 1858. It was Benjamin Barron Wiffens personal copy, who is also refered to in the text., and it was dedicated to him by Dr. Williams. I have only included the original illustrations as printed in the book, which are rather sparce, but I did not want to over-influence Dr Willaims original work. After the reprint of the book below, you will find a letter that Dr. Williams had published in The Lancet in June 1858 about a local case he had had. Regretfully, the Dr. removed the surname of his patient, or we would have had some very interesting health details about a specific person in Aspley Heath! The Topography and Climate, in reference to their influence upon Health and Disease, as compared with celebrated English and Foreign Localities. Second Edition, illustrated. By James Williams, M.D., member of the Royal College of Surgeons, etc. with remarks on the hygienic treatment of Consumption and other affections for which the locality is most suited. London : Printed and sold by Thomas Richards, 37 Great Queen Street . 1858. To Archibald Robinson, M.D., F.R.S., Northampton, whose many virtues, no less than his labours in the cause of science, have endeared him to the profession of which he is so distinguished an ornament, these pages are inscribed as a token of the respect and esteem of The Author. Sunbury Hill, Aspley, August 5th 1858. “Pulmonary Phthisis may terminate favourably in three ways: either by the absorption of the tuberculous matter, or by the change of this matter into a calcareous substance, or by the cicatrisation of cavities.” – Andral, Clinique Medicale. “That pulmonary consumption admits of a cure is no longer a matter of doubt: it has been clearly demonstrated by the researches of Laennee and other modern pathologists.” – Sir James Clark. “The important fact of the curability of the disease has, in our opinion, been satisfactorily established by Laennee. All the physical signs of tubercular phthisis have been present, even those which indicate the existence of an excavation: yet the disease has terminated favourably, and its perfect cure has been demonstrated by the presence of a cicatrix in that portion of the lung in which the excavation had formally existed. ….. Pathological anatomy has, perhaps, never afforded more conclusive evidence in proof of the curability of a disease than it has in tubercular phthisis.” – Dr Carswell, Cyclop. of Pract. Med., Art. Tubercle. “Our prognosis with regard to phthisis must undergo some modification, ….. when we repeatedly find forms and degrees of disease, that former experience had taught us to be utterly hopeless and speedily fatal, arrested, nay, sometimes even removed and almost obliterated by various processes.” – Dr C. J. B. Williams, London Medical Journal,Vol. I, p.2. Seven years ago, ill health and its consequences induced me to relinquish a good connexion in Herefordshire, on the borders of Wales, in order to secure a residence upon a dry soil, and in a more southern part of the kingdom. While casting about for my future home, an advertisement of a small practice in the village of Aspley in Bedfordshire decided my choice, and thus a seeming accident made me first acquainted with this favoured spot. I had always pictured Bedfordshire to myself as a bleak damp county; and having but little knowledge of its geological strata, I was pleased to find that the village of Aspley was upon a deep though narrow line of the greensand formation; a circular range of hills, of moderate elevation, extending from Tring in Hertfordshire to the neighbourhood of Biggleswade. I shall never forget the sensations I experienced in walking up the sandy lane leading to the village. Here, thought I, is the spot I have long sighed for; and forthwith resolved, if no insurmountable obstacles presented themselves, to pitch my tent, and set about industriously seeking that greatest of earthly blessings – health. Having determined to continue my professional pursuits, I accepted, in addition to the practice above mentioned, the medical charge of a large Union District. This opened to me a wide field, in which to observe the general condition of the health of the inhabitants, and the class and character of the prevailing diseases. 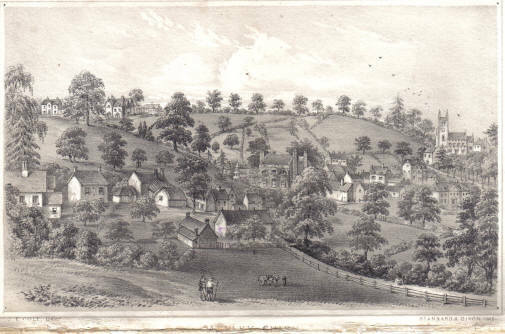 Sunbury Hill, Aspley, October, 1856. The favourable reception given to the first edition of my Observations on the Topography and Climate of Aspley Guise, both by the press and general public, ‘and the benefit derived by numerous persons who have availed themselves of the benefits conferred by residence in the locality, have induced me to undertake the revision and enlargement of the subject at this comparatively short period of time. I do so with the more satisfaction, from the fact, that many spontaneous testimonies have been since offered to the truth of the deductions I then ventured to lay before the profession and the public. I have now the additional satisfaction of quoting from two very able writers – Dr. Copland and Dr. Richardson – whose works contain views, on the treatment of consumption in particular, which are precisely in accordance with my own experience. The articles referred to were in the press at the same time as my “Observations,” otherwise I should have officially quoted their opinions in support of the principles I there laid down for the rational outdoor treatment of the diseases above-mentioned. I have thought that the addition of a few facts in the history of the village and neighbourhood might not be deemed out of place or unacceptable to the reader; as also a brief account of the peculiar geological formation upon which Aspley is situated, with the natural productions of the locality. Sunbury Hill, Aspley, Aug. 5th, 1858. THE TOPOGRAPHY AND CLIMATE OF ASPLEY GUISE, ETC. Aspley Guise as seen from the East. The rear of Woburn Lane from the East is seen on the left, Moore Place in the centre, and St. Botolphs to the right. House on the top left are those on West Hill leading to Woburn Sands. In giving a more detailed account of the village of Aspley, it may not be uninteresting to recall the associations of the great academy which, in its palmy days, I am informed, amounted to no less a number than two hundred and thirty boys, now scattered to the four quarters of the world. The school having been discontinued now some twenty years, we shall content ourselves with a few leading facts only in its past history. Conversing with a gentleman who was a pupil at the school some fifty years ago, he thus accounted for a large share of the popularity of this once favoured seat of learning. Mr. Wright, the second founder of the school, was a man of plain common sense, united to a frankness of heart and liberality of disposition. His leading ideas were to engage well-qualified teachers; to keep liberal table; to enforce exercise and supply amusements. It is no wonder that such a man became both popular and successful; and it is recorded “that many sickly half-nourished London boys nearly doubled their weight in six months.” Half-holidays were generally given upon birthdays, and all such occasions giving a healthful stimulus to both the mental and corporeal powers by relaxation from daily routine. The same gentleman states that, as a rule, there was little or no illness in the school, and fevers scarcely ever known. From Mr. Wright the manage­ment of the school was transferred to the Rev. R. Pain of Pembroke College, Oxford, who conducted the institution with much ability for many years. The schoolroom still remains, and fine old house (enlarged by the late proprietor), over which the bell still hangs in its accustomed place, though its tones have long since ceased to animate the youthful spirits who once obeyed its summons. Aspley School became celebrated not only for the amount of classical lore imparted to the boys, but for the foundation thus laid for a good manly constitution; undoubtedly an important element of success in the battle of life. On referring to Mr. Parry’s interesting work, The History of Woburn and its Vicinity, the following occurs at page 151:- “About two miles north of Woburn is a large and very handsome village (Aspley Guise), one of the most esteemed in the county for respectability and pleasantness of situation. In the record of Doomsday Book, Aspley, called in Latin Aspeleia, and as a portion of the barony of Bedford, formed part of the extensive possessions of the Beauchamps. 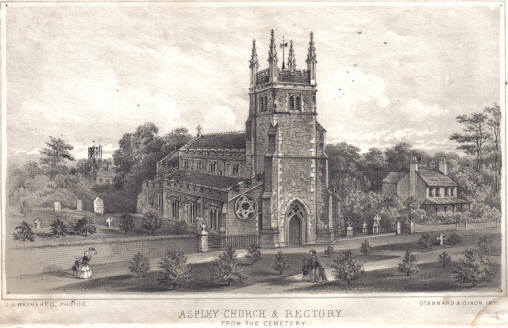 Aspley had formerly a market on Fridays, and a fair at St. Botolph’s-tide, granted to Anslem de Guise in 1267. The parish contains about a thousand inhabitants,” 1821(now 1,400), and has several handsome residences. “The church consists of a nave, north aisle, and chancel, on the south side of which is a window of the fourteenth century; the tower is large, and contains four bells.” (Mr. Parry.) It is but a just tribute the present rector, the Rev. J. V. Moore, to state that, during his incumbency (about twelve years), the church has been nearly rebuilt. A south aisle, chancel and vestry have been added, with a new and elegant roof, giving at once height and lightness to the interior. We must not omit to mention that, by addition of several feet to the north aisle, a space is provided for the organ, which is lighted from an oriel window. By this arrangement the organ-gallery was rendered unnecessary, and its removal has restored the uniformity of the interior of the building. The whole structure evidences the great liberality of the rector, and must have required a considerable expenditure of both time and money. It will long be an ornament to the village and neighbourhood. The addition also of a new cemetery, on the opposite side of the road, by the liberality of the Lord of the Manor, the Rev. B. H. Moody, forms another pleasing feature to the whole. It has been enclosed and planted at a considerable outlay, the money being raised by voluntary subscriptions;- a portion is set apart for the use of the dissenting members of the community. “Aspley Wood”, says Mr. Parry, “is one of the most beautiful and romantic in the kingdom, and has inspired Mr. Wiffen in his poem of “Aonian Hours.” Not the least source of its pleasantness consists in its thickets being, in the beginning of summer, over-spread with a profusion of those most beautiful flowers, “the lilies of the valley”; added to these charms we must not omit to mention that at this time the nightingale’s note reverberates through the livelong night. We are informed by Mr. B. Wiffen, that this layer of stone has a peculiar undulating surface, similar to the ridges and furrows of a ploughed field. This wave-like appearance is supposed by geologists to be produced by horizontal pressure at the extreme edges of the strata. Aspley being situated upon the greensand formation, I have thought it might add to the interest of the present publication to insert a copy of the geological section of that peculiar stratum which appeared in Buckland’s Bridgewater Treatise of 1837. It is there described as the London basin, and is identical with the Paris basin in the number and order of strata. It will be sufficient for our purpose if I confine myself to a description of the London basin. It consists of various layers, – the uppermost being known as the London clay; this contains nu­merous fossils. Two small points of elevation appear – Hampstead and Sydenham – upon which a layer of marine sand is visible of small extent. Under the London clay is a thin layer of plastic clay and sand. The third, and by far the largest stratum is chalk, varying from 600 to 1000 feet, containing both hard and soft chalk, nodules of flint, and a considerable number of strictly marine fossil remains, both plants and animals. The fourth layer is composed of gault clay, varying from 10 to 180 feet; it effervesces with acids, as does also chalk; it contains balls of argillaceous limestone, iron pyrites, etc. The fifth layer, the greensand, is more fully described hereafter. 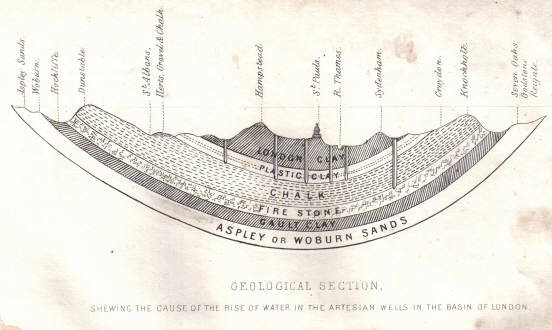 The accompanying section of the London Basin is copied from the Bridgewater Treatise by Dr. Buckland (1837), and shows the rise of water in Artesian wells bored into the chalk stratum, from which it cannot escape. The water enters the basin at its extreme points, and filters through the strata to the lowest portion. These wells have been long used in China, where they have bored to the depth of 1000 feet; the greatest depth in this country is from 400 to 600 feet. Aspley is situated upon the northern edge of the greensand which underlies the chalk London basin, and about forty miles north of London. This greensand formation is so peculiar and local, that if it were possible for a person to be suddenly wafted from Aspley to the corresponding elevation at Reigate or Godstone without his knowledge, he might consider himself still in the same part of the country, judging from the soil and nature of its productions. In the Bridgewater Treatise before mentioned, this stratum is named Woburn sand, though Woburn itself is not actually upon the greensand. It should more properly have been called Aspley sand; but the identity is sufficiently clear to prove that this particular spot was once the edge of a marine basin. The green colour of the sand is due to chloritious silicate of iron, a combination of sea-salt (chloride of sodium), and iron shale, with which the sand is intermixed in its native position. I subjoin a brief extract from Trimmer’s Geology, as it may interest persons resident (or about to reside) in the locality; and may, with the account of the fossils peculiar to that part of the cretaceous system, serve to interest them in the collection and study of these organic evidences of the great events of the past. The Lower Greensand. – This subdivision consists of sand and sandstone, ferruginous in the upper part, green in the lower part, and containing layers of chert, local beds of marl, ochre, fuller’s earth, and clierty or chalky limestone; thickness, 30 to 100 feet. Gault or Golt. – A light blue argillaceous deposit, generally clayey above, marl below; thickness 10 to 180 feet. Upper Green Sand. – Green, grey, or white sands, sometimes passing into cherty or chalky sandstone, with layers and nodules of chert. The green colour is derived from grains of silicate of iron, which is a variety of chlorite. It is disseminated more or less through the lower part of the cretaceous system, not only in England, but very generally on the continent of Europe, and even in the cretaceous sands of America; thickness about 250 feet. Greensand formation, thickness 580 feet. Upper Greensand (Firestone, Malm rock). Gault (Petsworth clay; Folkstone clay). Lower Greensand (Iron sand; Shanklin sand). Turrulites costatus, chalk and greensand. These fossils of wood are found in gravel-drifts, varying in size from a few inches to ten or twelve inches in length, apparently broken pieces. In several instances whole trunks have been discovered imbedded in the sand; and I may instance a large specimen belonging to Wm. Fitzwilliam How, Esq., which, although broken in its removal, he had the good taste to reunite, and fix up against a wall in his garden. I have consulted various geological works in reference particularly to this formation, in order to arrive at some correct data of its peculiar effect upon climate, but have been unable to find any peculiar or specific properties attributed to it. Medical authorities agree in considering a dry sandy soil as most conducive to health, and, compared with other soils, certainly the warmest. Reigate in Surrey, on precisely similar soil, is recorded by the Registrar-General as one of the healthiest places in England; this, no doubt, is due in a great measure to the soil upon which it is situated. It would add much to the interest of the present subject if some one resident there would make meteorological observations. I think it more than probable some approximation would be found there to that equability of temperature so remarkable in Aspley. In another part of this book I have mentioned the pine-sheltered walks and rides with which the lo­cality abounds; they give a cheerful appearance, even in the depth of winter, from their green and luxuriant foliage, and extend for several miles in a west­ward direction over Aspley and Bow-Brickhill Heath. It is worthy of remark that, by the liberality of his Grace the Duke of Bedford, these beautiful groves are open either to pedestrian or equestrian visitors. Here may be said, as of the Undercliff, that the natu­ralist may ramble and pursue his studies with the greatest success, as it abounds in many rare varieties of both flowers and insects. Its many charms are eloquently described by the late talented poet, J. H. Wiffen, in his Aonian Hours; but I must content myself with a very brief quotation from his interesting description of this sylvan spot. Blue ocean seems to roll, and mimic waves are driven. And tinging all things with enchantment’s hue. The soil of the Heath is sandy and poor; but underneath it lies the valuable mineral Fuller’s earth. There is also excellent water within about thirty or forty feet of the surface. This portion of land – containing about sixty or eighty acres, an outlying portion of Aspley and Wavendon parish – has fallen into the hands of a distinct colony of independent set­tlers, who have erected tenements of some little value upon it, and reclaimed portions of the land from barrenness. It is to be regretted, from its great natural beauty, and proximity to the road and to a first-class railway station, that it has not fallen into other hands, and become the site of a better class of houses; such will, I have no doubt, be the case at no very distant period. In regard to the evergreen pine plantations, I may just remark, that all trees of this class grow most luxuriantly on the Aspley Sands. Upon this head Cambers, in his article on “Arboriculture,” says, “No tree, a native of Britain , can with more safety be planted out into any soil and situation, provided only that the soil be a dry one. I have seen a crop of good Scots fir taken off almost every sort of soil of an earthy or strong nature; but upon a mossy soil I have never seen good Scots fir-timber grow.” A very large portion of Aspley Heath was, until lately, covered with these self-sown trees, the greater portion, no doubt, wafted from the adjoining beautiful groves belonging to his Grace the Duke of Bedford. While on this subject, I will just notice another local fact, – that the oak trees of this particular spot are very poor and stunted in character, and consequently not desirable for cultivation. I may mention, also, that we are remarkably barren in our number and variety of ferns. I have only found some four or five Orders. The Osmunda Regalis is recorded in the Bedfordshire Flora as being indigenous in Aspley Wood; I must, however, reluctantly express my doubts as to the accuracy of this statement. It is not, however, to be wondered at that we have so few ferns, when we remember, that, according to the best authorities, “The Filices are widely distributed, delighting in humid soil and shady situations;” The former is not to be found about Aspley, hence the few varieties of ferns in this locality. In order to add to the interest of the present work, I have introduced a catalogue of the wild flowers of the locality. The following rare plants (in Bedfordshire) are found at Aspley (only), according to Abbot’s Flora Bedfordiensis, published in 1798. CLIMATE OF ASPLEY GUISE, ETC. It would be idle to pretend that Aspley, or any other place, enjoys an immunity from the several physical scourges which afflict mankind. Even in this place, though acute and inflammatory diseases are very rare, those of the chronic type supply, in some measure, their place: scrofula, bilious affections, etc., (due in some degree to the sedentary habits of the poorer population, formerly employed in lace-making), and now and then consumption, claim their victims. I say now and then; for experience and unquestionable evidence have satisfied me that the average mortality is lower here than in almost any other place with which I am actually acquainted. The building at the centre of Aspley Guise, now Moore Place Hotel. In connexion with consumptive cases in particular, one fact is very remarkable, – that persons afflicted with positive and incurable disease, live much longer here than in almost any other part of England, save our much sheltered southern coasts. I may here mention consumptive cases I have been in attendance upon, where there has been positive abscess in the lungs for periods varying from five to eight years, with all the ordinary attendant symptoms of general consumption; night perspirations, diarrhoea, etc. Let me also remark, that though these invalids occasionally suffer much, yet they enjoy life comparatively, and though looking forward hopefully to a better existence, still life has its endearments left. Our heart, our strength, our fortitude require! Against this little throb of life conspire! Another fact was in the course of a little time forced upon my attention, that several persons, coming from distant places, labouring under bronchial and other affections of the lungs and windpipe, exhibited marked improvement in their health after a short residence in this neighbourhood. Some who have been patients of my own, quickly discontinued medicines, which, attention to diet, and the free enjoyment of a healthy atmosphere and more equal temperature, had rendered unnecessary. To return to our subject. The air of Aspley generally, and particularly of the elevated parts, is very dry, and therefore suitable to nervous affections and relaxed states of the system. The comparative absence of neuralgic complaints seems to favour this view, and the benefit derived by those who, coming from other places, have suffered from such affections, tends also to the same conclusion. On the other hand, the infrequency of rheumatic and gouty affections and acute inflammations, fur­nishes evidence of the dryness of the air, equability of temperature, and purity of the water, inasmuch as the reverse of these circumstances is a fertile cause of such complaints. The next fact of interest in the sanitary condition of Aspley is its exemption from endemic or localized disease. As far as I can learn, typhus fever and other kindred affections have never arisen here spontaneously; the few cases which have occurred have been imported, or caused by some neglected impurity; and from this I infer that our general dryness of soil, free air, and good water, are the greatest safeguards against such melancholy visitations. The general position of the village is sheltered by hills of moderate elevation; but, as far as my own experience goes, its healthful tendencies appear not to be due to that cause, inasmuch as my observations, made in three different parts, vary but little in the range of temperature, although more moisture is evident in the lower valley-like portions. The air is particularly dry and bracing, and upon the elevated parts exposed to the west, is compared by many to a sea breeze. The general temperature is but slightly below that of the Undercliff of the Isle of Wight. Sufficient evidence to those who may think the place oppressively hot in summer, is, that the average temperature of July and August is 61½° of Fahrenheit only. The greatest range of temperature is in these months, and the smallest in November and December which may be considered of no little importance to be consumptive invalid, who is generally as much tried during the latter part of the year as in the spring months. The principal feature in this locality is the dry sandy character of the soil; and the leading property of sand being its great power of absorption of both heat and moisture, its effect is to render the surface of the ground sufficiently dry for exercise, even immediately after heavy rain; and also, in hot weather, to cool the atmosphere, by absorbing the superfluous heat; from hence we get radiation of the latter during the night, diminishing cold, and thus an equilibrium is approached, and the small variation of the temperature partly accounted for. This sand stratum in the higher parts of the village has been ascertained to be nearly 100 feet deep, Underneath this we get springs of the finest water, bright and sparkling, nearly free from earthy impregnation, and, in addition, soft – an invaluable property when found in spring water. The absence of a river may be thought the only failure in the beauty of our scenery; but in regard to health that absence is, no doubt, a benefit, as nothing could contribute so much to dampness of atmosphere. It is perfectly well understood by medical men that no single cause tends more to the development and continuation of neuralgia in its various forms and complications, than damp, or excess of moisture. Supposing the air to be damp, it would naturally be more so during the night. To test this influence, I slept for the whole winter with my bedroom window open, and can honestly say my health was never better: a sufficient answer to the popular error of excluding the “night air”. Reflecting upon the above facts, I commenced a series of meteorological observations, in the hope that I might, by their aid, arrive at some explanation of the peculiar course of certain diseases in this locality. Extending my experiments over six years, the prin­cipal conclusion I arrived at was, the exceedingly equable character of the climate, or non-variability of atmospheric temperature. The following, Table I, compiled with the aid of Sir James Clarke’s admirable work on Climate, proves that in this particular Aspley equals, and in some respects (hereafter to be pointed out), exceeds, even the Isle of Wight, Hastings, Montpelier, Torquay, etc. The smallness of the average daily range of tem­perature during the year, or of the mean annual variation of day and night, appears to be exceeded by only one known locality – Pau in the south of France; and thus places Aspley in a prominent position as a residence for diseases benefited by equability of climate and the absence of intense heat in summer, as illustrated by Table II. Having briefly considered the peculiarities of Aspley in regard to diseases, situation, soil, etc., it will be desirable to review, generally, the conditions most favourable to health, and as influenced by climate more particularly. Upon this subject, Sir James Clark says, – “And here I would comment upon the error of expecting too much from, mere change of climate. The air or climate is regarded by the patient as possessing some specific quality, by virtue of which it directly cures his disease. This erroneous view of the matter not unfrequently proves the bane of the invalid, by leading him, in the fulness of his confidence in climate, to neglect other circumstances as essential to his recovery as that on which his hopes are fixed. A residence in a mild climate will no doubt often do much; among other advantages, for example, it will enable the invalid to be much in the open air, during a part of the year when, in his own country, he would be either confined to the house, or exposed to an atmosphere more likely to increase than mitigate his complaints. The exercise enjoyed in a temperate atmosphere, while it gives tone to the nervous system, improves the general health, and relieves the affected organs by promoting and maintaining a more free and equable circulation in the surface and extremities; and the constitution, thus invigorated, may be enabled to overcome a disease under which it would have sunk in less favourable circumstances.” After speaking of the necessity for dietetic management and patient perseverance in the course laid down, the same able authority goes on to say, -“Here, as in every other department of the healing art, we must be guided by experience, and must rest satisfied with the amount of power which the remedy concedes to us. The charlatan may boast a specific for many, or for all diseases: the man of science knows that there exists scarcely a single remedy for any disease which can warrant such a boast; and that it is only by acting on and through the numerous and complicated functions of the living body, in various ways and by various means, and by carefully adapting our treatment to the circumstances of each individual case, that we can remove or check the disorders of the animal system, more especially those which have long existed. In the earliest days of my pupilage I had one maxim deeply impressed upon my mind from the writings of Dr. Gregory, viz., that we must not regard remedies as direct agents in the cure of disease, but that they are intended by their action upon the animal economy to place the “vis medicatrix naturae,” or natural powers of the system, in the most favourable state to resist and cure disease. (The previous writer also says, – ” In the first place, I would strongly ad­vise every person who goes abroad for the recovery of his health, whatever may be his disease, or to what climate soever he may go, to consider the change as placing him merely in a more favourable situation for the removal of his disease.”) Twenty years expe­rience has entirely confirmed this view of the healing art; and, in furtherance of these opinions, I proceed to support the proposition with which I commenced; viz. the healthful combination of circumstances in Aspley more particularly tending to the cure and prevention of disease. From this extract it is pretty evident that this very property, equability of climate, may be over-sought; and it is upon this fact I base my whole statement: that the moderate and gentle range of temperature, combined with dryness of air and soil, prevailing in Aspley, demand for it a high position, as one of our best English residences for certain prevalent and often intractable diseases. I am aware that, in making this assertion, I am approaching a position in some degree open to question; but I am so well convinced by patient observation, no less than by popular belief, that I feel no hesitation in stating my views on the subject. A little reflection will show that, in the above paragraph, we have an outline of the system to be pursued, when our health has become impaired from causes of injurious tendency, and at the same time it furnishes us with a clue to the earlier predisposing causes of bad health even in our infancy. There can be no doubt but that our incapacity to bear atmospheric change has arisen from the errors inseparable from an artificial existence. By this I mean the complete change now observable from the age when windows were unknown. No one cause, I am persuaded, has tended more than this to physical deterioration. To doubt this would be to deny the effect of change of air, and consequently the utility of change of climate, for it is evident if any effect is obtained, it must be found in some chemical or physical condition of the air in the locality we seek. To make myself intelligible to the unprofessional reader, I must briefly explain that the constitution of the air we breathe is partly of a chemical, and partly of a physical nature; the chemical one being oxygen, the life-giving principle, and the neutral one nitrogen, which is useful principally as a diffusing agent; a small quantity of carbon is generally found in combination, but not necessarily: this has no beneficial use, and in excess would be highly injurious to life. We also find a considerable quantity of aqueous vapour, which is, however, liable to great variation in quantity, and upon this will depend, very much, the healthful effect, or otherwise, of the air inspired. Life cannot be supported without a constant supply of air, and, indeed, it should be so arranged that no part of the air once expired or given out from the lungs should ever enter them again. The air which was inhaled in a state of purity comes out of the lungs highly charged with carbonaceous matter thrown out of the system, and also with a quantity of watery vapour. This exhausted air, (the oxygen being re­moved by absorption into the blood), will, if concentrated and inspired unmixed with fresh air, speedily destroy life, being, in truth, poisonous in its effect upon the system, if re-introduced. It will now be readily understood how much depends upon the admission of a constant supply of good fresh air; and this will be more evident when we are informed that the skin of the human body is constantly exhaling the same poisonous gas – carbonic acid – tending vastly to deteriorate the atmosphere in any closed arid unventilated room. When it is an ascertained fact that no less than four thousand gallons of air, or sixty hogsheads, pass in and out of the human lungs in twenty-four hours, we shall soon understand the frightful deterioration of air which must take place in an ordinary bedroom, carefully curtained, and the chimney opening still more carefully papered up, or barricaded with stuffed bags of hay, etc. These obstinate efforts to exclude the night air, damp, etc., have a far more powerful effect upon young children. Deteriorated health in the parent gives an hereditary taint to the offspring – “but where this does not exist, the same disorders may be speedily induced in children of the healthiest parents, if they are exposed to the causes known to induce it. Whatever injures the health, may lead to tuberculous cachexy, (incipient consumption); residence in a low, damp, and chilly situation – long confinement to close, ill-ventilated rooms, whether nurseries, school-rooms, or manufactories – deficient exercise in the open air – imperfect clothing – improper food, either deficient in quantity, or of innutritious quality – or the habitual use of over-stimulating diet, by inducing imperfect assimulation – may lead to tuberculous cachexy. The offspring of the healthiest parents may thus become tuberculous in early life, if exposed to the exciting causes enumerated. The earlier in life these causes are applied, the more rapidly, in general, will their effects be manifested.” (Sir James Clarke.) It is an almost admitted fact that bad health, in most instances, is traceable to our own misconduct, or misapplication of the laws of health, which in other words, are infringements of the laws of nature, the ordination of the Creator himself. The vicissitudes of our climate are, of course, a part of those laws, which we are strictly bound to obey- If we err from ignorance, we are as clearly bound to suffer the penalty of that ignorance, inasmuch that knowledge is within our reach. It too often happens, that man thinks but little of his helpless condition, and his dependence upon these laws for the enjoyment of health of body and serenity of mind, until impaired health, by interfering with either his occupations or his pleasures, renders it necessary for him to consider the slender thread upon which so much depends. Thus it is that experience is dearly bought, and the means of preserving health are only valued when we are threatened with the loss of it. To return to our subject. The air of Aspley is generally admitted to be very pure, buoyant, and exhilarating. Its freshness, particularly in elevated situations, has been compared, as I have said, to a sea-breeze. This is partly due to the undulating character of the surface of the ground, and the open free circulation admitted by the widening extremity of the valley-like portion to the south-east. I must add also, that from the rapid fall in the drainage, all noxious matters are speedily removed from proximity to the village, and we shall shortly show that, from the small annual fall of rain, but a limited quantity of moisture generally exists in the air. 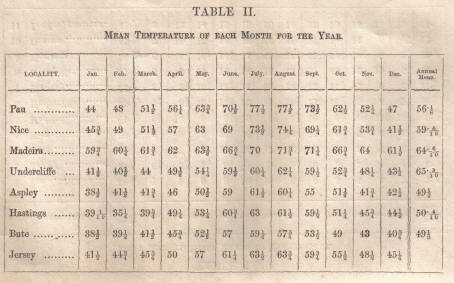 In support of the statement as to the dryness of the atmosphere of Aspley, it will only be necessary to refer to Table III, by which it will be seen that the number of rainy days is comparatively small, even including those which come under the term drizzly, and which we are not assured are included in all Sir James Clark’s tables. Winter has most rainy days, but summer the most rain. The average number of rainy days in the year on the eastern side of this island is 135, while on the western it is 205. We find that London has 178 rainy days in the year, Hastings 153, Undercliffe 146, Exeter 162, Aspley 121; and of foreign climates, Pau has 135, Madeira only 70. This latter is very remarkable; and the more so, when we find that the aggregate quantity of rain exceeds that of Aspley by no less than ten inches. After this deduction, I think it must follow that the atmosphere there, ring the rainy season, must be very damp and injerous to health, particularly in relaxed states of the system. This will be still more obvious when we find from the authorities I have hereafter quoted, that the ground in Madeira is generally damp for nine months in the year. 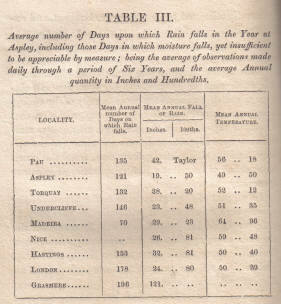 Table III: Average number of Days upon which Rain falls in the Year at Aspley, including those Days in which moisture falls, yet insufficient to be appreciable by measure; being the average of observations made daily through a period of Six Years, and the average Annual quantity in Inches and Hundredths. Further evidence of the dryness of the air of Aspley will be found in the small annual fall of rain. In this particular my observations extend over a period of about six years, during which time, by very care­ful admeasurement, it only amounts to 19½ inches; an inch more than Paris (18½); the same as Toulon (19½); and four inches only more than at Marseilles. And, so far as I can learn, the annual fall of rain at Aspley is less than in any known English locality. This, with the entire absence of any river, or considerable stream, accounts for and strengthens the evidence of the dryness of its atmosphere. We need only glance at the enormous annual fall of rain (121 inches) at Grasmere , in the lake district, to under­stand the effect of western gales upon the localities exposed to them. To this may be added the influence of the hilly character of the locality around Grasmere in attracting clouds. A similar amount of rain and moist winds at Jersey, leads to a very damp and misty, though mild atmosphere, and to a general prevalence of rheumatism as the certain consequence. We may again beneficially quote Sir J. Clark upon this subject, as his views are so perfectly in accord­ance with my own experience of different localities, and their peculiar influence in producing or obviating disease. He says, “It may be stated as a general rule, that houses in confined, shaded situations, with damp courts or gardens, or standing water close to them, are unhealthy in every climate and season, but especially in a country subject to intermittent fevers, (ague, etc. ), and during summer and autumn. The exemption of the central parts of a large town from these fevers is explained by the dryness of the atmosphere, and by the comparative equality of temperature which prevails there. To illustrate more forcibly the influence of mode­rate elevation upon temperature, from the consequent diminution of moisture, I shall avail myself of a quotation from that instructive and amusing book, White’s Natural History of Selborne. I do so more particularly, as almost identical effects were produced at Aspley in the severe frost of last year (1855). The evergreens suffered severely in the valley, but scarcely at all upon the elevated parts of the village. The passage I refer to occurs in Letter CVII. I could adduce further evidence, if required, illustrative of the above facts; but it is generally admitted by those who have paid attention to the subject, that moderately elevated situations are the driest, and relatively the warmest, in most, if not all localities, particularly in winter. To return to our subject, – the healthful tendencies of Aspley, in consumptive and nervous affections more particularly. I shall feel it necessary to quote the experience of native authorities, who have resided in the localities, in order to show the particular influence of climate upon the like affections. I think it better to do so rather than such data should appear dependent upon any uncertified views of my own. These localities have been occasionally recommended as affording good winter residences for invalids; but the experience of later years has gone entirely in opposition to such advice; and the general and leading characteristics of the climate, according to the best authorities, show that there never was the least reason to recommend them. Having thus glanced over the peculiarities of these climates, closely approximating both to Nice and Aspley, I proceed to describe Nice more in detail. Its mean annual temperature is fifty-nine; being eleven degrees warmer than London; ten warmer than Aspley; seven warmer than Penzance; three warmer than the Undercliffe; one colder than Rome; live colder than Madeira. The temperature is more equally distributed throughout the year at Nice, than at any other place in the south of Europe, except Rome and Cadiz. The climate of Nice during the winter has many advantages; the maritime Alps form a lofty barrier, which shelter it in some degree from the northerly winds during winter, and the cool sea-breeze, which prevails every day with a regularity almost equal to that of a tropical climate, moderates the summer heat. Notwithstanding the extent, however, to which Nice and its environs are encircled by mountains, (and it is so in a great measure from W.S.W. to E.S.E.) it is by no means exempt from cold winds during the winter, and still less so during the spring. The easterly winds are the most prevalent during the latter season. They range from east to north-east, frequently blow with considerable force, and are often accompanied with a hazy state of atmosphere. From the north-west, or mistral, which is the scourge of Provence, Nice is pretty well sheltered. But towards the end of the mistral, when it takes a more westerly direction, the keen dry quality of the air is very sensibly felt, whilst it prevails. The winter is a season of flowers, the dryness of the air rendering the degree of cold less injurious to the inhabitants, than it would be in a more humid atmosphere. Spring is the most unfavourable season; the sharp chilling easterly winds are the greatest enemy with which the invalid has to contend, and the prevalence of these, during the months of March and April, forms the greatest objection to this climate, especially in pul­monary diseases. These sharp easterly winds, however, are not pecu­liar to Nice, but prevail more or less over the whole south of Europe. They are equally bad at Naples , somewhat softened at Pisa , and still more so perhaps at Rome . In consumption, the disease with which the climate of Nice has been chiefly associated in the minds of medical men in this country, little benefit is to be expected from the climate. Dr. Skirving, who for many years practiced in Nice with great reputation, states that in complicated consumptive cases, the climate of Nice is of doubtful I’llicacy; on the other hand, consumption unattended with gastric complication, more particularly in torpid constitutions, was benefited by residence there. Indeed, by carefully considering both Sir James (!lark’s and Dr. Skirving’s views, we can only arrive at the conclusion, that the early and simple states of tuberculous cachexy, or consumptive tendency, are the only cases likely to derive much benefit from residence at Nice. In chronic bronchitis, which often simulates phthisis, very salutary effects are produced by a residence at this place (Nice). The average daily range of temperature during the year, amounts there to 8½ deg., while at Aspley it is eight only. The closest approximation to Aspley, in regard to equability of temperature, is Pau, in the south of France. “There the temperature,” says Dr. Play fair, the resident physician, “is 2° warmer during the win­ter than the warmest parts of England; and about 5° colder than Rome. 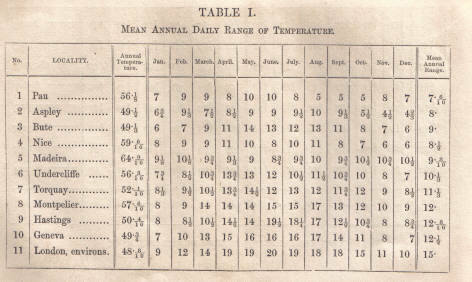 The spring is 4½° warmer than England, and 2½° colder than Rome.” Dr. Playfair also found that gastric (or stomach) affections were much benefited by residence at Pau; “but when accompanied by a relaxed state of the system, with copious expectoration, the climate does not in general prove beneficial.” Again, when we are informed by Dr. Taylor, that the annual fall of rain amounts to forty-two inches, and that the temperature is liable to very sudden changes, we shall soon be of opinion that even the climate of Pau must be estimated with considerable qualification. We find then that snow showers are slight and soon disappear; and that though December and January are cold and dry, the sun is often bright and warm during these months, enabling the invalid to take exercise out of doors. February is milder, but towards the end of the month spring rains fall, and the weather, as in most places, is chilly and disagreeable. March is mild and variable, though with the advantage of the absence of cutting winds. In spring, westerly winds, which are soft and mild, accompanied with rain, alternate with dry easterly winds, also of a mild character. Hence it is that the vernal exacer­bation of inflammatory affections of the stomach and lungs (so commonly observed in other climates) is little felt by invalids at Pau. One great disadvantage, however, in my opinion, is, that during July, August, and September, the thermometer often rises as high as 94° in the shade, with a powerful sun, preventing exercise from eight in the morning till seven in the evening! “The island of Madeira ,” says Dr. Heineken, “possesses advantages over our best continental residences. It is warmer in winter, cooler during sum­mer; there is less difference between day and night, and also between one season and another, and in successive days ; it is almost exempt from keen cold winds, and enjoys a general steadiness of weather to which continental climates are strangers. During summer the almost constant prevalence of north­easterly winds, especially on the north, and the re­gular sea and land breezes on the south side of the island, maintain the atmosphere in a temperate state. The sirocco, which occurs two or three times at most during the season, and then continues only for a few days (seldom more than three), sometimes raises the thermometer in the shade to 90°; with this exception, the summer temperature is remarkably uniform, the thermometer rarely rising above 80°. Such, indeed, is the mildness of the summer at Madeira, that a physician, himself an invalid, who resided there for some time on account of his health, doubted whether this season was not more favourable to pulmonary invalids than the winter. “Autumn is the rainy season, and towards the end of September, or the beginning of October, the rains commence, accompanied with westerly, or south­westerly winds. In November the weather clears up, and generally continues fine and mild until the end of December. About this time snow usually falls on the mountain at Funchal, attended by north-west winds, and the weather continues more or less damp through January and February; but fog is never seen, and during this, the winter, the thermometer at sunrise is rarely ever found below 50°. The sensation of cold, however, is then greater than with an equal temperature in England. And this is the case also in Italy. In clothing, invalids must not trust too exclusively to the thermometer; their sensations are a better guide in this respect. The spring at Madeira, as at every other place, is the most trying season for the invalid, and will require even there a correspond­ing degree of caution on his part. In March, winds are frequent; and April and May showery. These observations have been carefully made by Dr. Renton and the late Dr. Heineken, who resided there the last nine years of his life, so that the utmost reliance may be placed upon them. The result of their experience goes to show the necessity of sending consumptive patients there only in the very early stages of the disease, and thus adopting change of climate as a means of prevention rather than as a cure. Dr. Renton, in a sensible paper published in the Edinburgh Medical and Surgical Journal, makes some judicious remarks on the “inutility, not to say cruelty,” of sending patients in the more advanced stages of consumption to Madeira. The latest experience goes to prove that the climate of Madeira, generally, must be looked upon with considerable qualification and distrust, as during the present year there has been a terrible outbreak of cholera, which has, in a comparatively short time, carried off two thousand persons out of a population of about fifteen thousand. This is not surprising when we remember that Dr. Renton stated, as much as ten or twelve years back, that bowel complaints very generally prevailed among the lower orders, and that dysentery was often endemic there. I have before alluded to the climate of the Undercliffe (or south side of the Isle of Wight), and I shall conclude my extracts with some observations upon its peculiar properties and influence upon disease, though its principal utility consists in its being a good winter residence for consumptive and cachectic affections. “The soil of the Undercliffe, consisting of the de­tritus of the sandstone and chalk from the incumbent cliff, is naturally dry, and speedily regains its dryness after rain. The nature of the rock, and the general I shelving of the surface, likewise contribute to render Undercliffe a dry situation. “The climate is remarkably equable, as well as mild and dry, and there are not many days during the winter on which the invalid cannot take exercise in the open air. The mildness and dryness of the climate, during the winter months, may be in some degree estimated by the circumstance of myrtles, geraniums, sweet scented verbena, and various tender and greenhouse plants, usually withstanding the win­ter in open flower-borders. The honey-bee likewise continues working in ordinary seasons, until after Christmas. The absorption of heat by the almost perpendicular cliffs which back the Undercliffe, ex­posed as they are to the rays of the sun during the whole day, must be considerable even in winter; and the radiation of this heat during the night, no doubt tends to equalize the temperature. “To the invalid who has cultivated natural history, this sheltered district and neighbourhood possesses an additional advantage. It is rich in varied and interesting plants: indeed, the specimens of natural history with which it abounds, offer abundant inducement to exercise and mental occupation to the cultivators of this delightful science. “When we consider the numerous local advantages of the Undercliffe, already detailed, and the result of the meteorological observations appended, and also take into account the still more conclusive evidence furnished by the condition of the exotic plants which grow there, we must acknowledge it to be one of our warmest winter climates, and most eligible residence for a large class of delicate invalids. With respect to the most decisive evidence of all, in a medical point of view, namely, the effects of the climate on pul­monary disease, my experience is favourable. “With a temperature nearly the same, the climate of Torquay is soft, but rather humid and relaxing; while that of Undercliffe is dry, somewhat sharp and bracing. The winter temperature at these two places differs very little. Although at Torquay the temperature rises somewhat higher, it likewise sinks lower than at Undercliffe, giving the latter the advantage in point of equability of temperature. “These qualities peculiar to the two places respectively, render them suitable to different diseases, and in different complications of the same disease. For pulmonary invalids, the best season at Undercliffe is from November to May. The same may be said of Hastings as of the Isle of Wight, from which it differs but little, and perhaps less from Torquay; its atmosphere is rather moist and relaxing, it is, however, protected very much from northerly and north-easterly winds, by the perpendicular cliff, which rises immediately behind the narrow slip of beach, which, from its limited room for exercise, is a disadvantage to the invalid. Its superiority consists in the shelter from the north and north-westerly winds of December and January, and this to persons labouring under irritable states of the lining membrane of the lungs, is certainly a consideration, but where anything exists approaching to nervous headache connected with indigestion, or a tendency to epilepsy or apoplexy, residence here has not been beneficial. The higher parts of Hastings would be the most suitable in such cases, and where protection from cold winds is not an object. In reviewing the various climates approximating to that of Aspley, I am induced to add a few words in reference to Jersey and Guernsey, the temperature of both places being very similar to Aspley. Dr. Hooper states, that “the actual number of days of rain, falls short of that of the south-west coasts of England, but as the showers are generally copious and of long duration, the quantity of rain, if properly estimated, would be found greater at Jersey; this, added to the thickly wooded state of the Island, and insufficient drainage, combine to render the atmosphere extremely humid. “Jersey enjoys an early spring, and a protracted autumn; vegetation being forward in March, and the landscape far from naked as late as the end of December. The dreary aspect of winter is, therefore, short-lived.” The island is particularly subject to fogs, from which, and the constant humidity, we shall not be surprised to find that chronic rheumatism is a prevalent disease, particularly in rural districts, and is universal after the age of thirty; dyspepsia, disease of the liver, and dropsy, are also prevalent. Scrofula common; intermittent fever rare; remittent fever common; consumption is said not to be frequent, but no reliable information on this point is at present on record. A little consideration will show, that mere temper­ature is not the only consideration in regard to health, and plainly evinces that in Aspley some other qualities of air, soil, etc., essential to health, are in operation, as rheumatism particularly is very rare amongst us. “Now, on the strength of the Registrar-General’s report, we may be allowed to put in a plea in favour of home. We do not say there is no place like it, but still the conduct of our countrymen of late years has been as if their own land was a prison from which a natural instinct prompts a flight at the first moment of liberty. The usual argument is that health demands a change of air, and therefore a foreign clime must be visited. Now, it is proved that England, ‘ crowned with hills of moderate elevation sloping towards the east and south,’ ‘ bathed by the showers of the Atlantic,’ – though we will not lay much stress on this peculiar attraction, – ‘ cultivated more extensively than other lands, and producing those unequalled breeds of animals which flourish only in healthy places,’ enjoys a salubrity beyond any of those countries to which the flight of English pleasure-seekers is directed. Why not, then, recur to the habits of the old times, and travel about England, of which Home of our countrymen know much less than of the Rhine, the Danube, and the Tagus? From the above extract, if evidence were wanting, it is abundantly proved that England is much healthier than any part of the continent of Europe. Continental cities exceed London generally in mortality by five per thousand, and in many instances by more than fifteen per thousand. England generally (the last half year) has only reached twenty-one per thousand, the ordinary annual average being twenty-three. This effectually disposes of the grounds or necessity of our seeking continental residence on any plea of healthful tendency. In some English country localities the mortality only reaches fourteen or fifteen per thousand, and in addition they have powerful aids to general good health – dry soil, pure air, good water, and equability of temperature, etc. – all of them serviceable to persons labouring under diseases in which debility is a prominent symptom – as consumption, chronic bronchitis, asthma, dyspepsia, liver complaints, epilepsy, nervous and neuralgic affections, spinal disease, etc. Thus the necessity at once falls to the ground for leaving our native shores on the plea of ill-health; to say nothing of the uncertainty of success or benefit, – of the misery consequent upon a wrong selection, particularly of a distant foreign climate – nor of the pain of separation from friends and home comforts, so essentially necessary to recovery, which are the certain lot of all who seek a distant foreign locality. It is to the invalid I particularly address myself; one reduced perhaps by pain and sleepless nights, or harassed by some obstinate chronic malady; and to such I would say, think again before you contemplate encountering the inseparable discomforts of a protracted journey, ending possibly in disappointment. I need only refer the reader to the tables in this work, to convince him that whatever be the advantages sought by the invalid in a foreign residence, whether dryness of soil, purity of air, or equability of temperature, they can all be found, at least in an equal degree and with more favourable combinations, much nearer home. It must be evident to any reflecting and unprejudiced mind, that these various data relating to the village of Aspley are very remarkable and of no common order, and such as are rarely found associated in any strictly inland district. Many of the facts which I have recorded do not rest upon my own ex­periments alone, but are supported by those of a gentleman remarkable for accurate and patient observation, particularly in regard to one of the leading characteristics, the small annual fall of rain, as, upon comparing notes, we found the quantities approximate within a few hundredths of an inch. It is now my wish to introduce the reader to Dr. Richardson’s excellent work, the Hygienic Treatment of Consumption (On the Hygienic Treatment of Pulmonary Consumption, by Benjamin W. Richardson, M.D., L.R.C.P. London: John Churchill. 1857.) as it contains a complete and perfect exposition of the only successful method of treating the malady in question. I shall content myself with quotations, but must entreat all who may be afflicted with this insidious disease to make this eloquent and practical treatise their daily study. OUTLINE OF A HYGIENIC CODE FOR THE TREATMENT OF CONSUMPTIVES. “A supply of pure air for respiration is the first in­dication in the treatment of the consumptive patient. In all cases of consumption, the attention of the physician should be at once directed to the quality of the air breathed by the patient. It may seem dogmatical, but it is true, that in an atmosphere containing one per cent, of the carbonic acid of the breath, with the natural but as yet undetermined amount of ammonia evolved with the carbonic acid, in such an atmosphere a consumptive patient, though in the earliest stage of the disease, cannot possibly recover under any form of medicinal treatment; while in those predisposed to the disease, the inhalation of such an atmosphere, even at intervals, will aid materially in inducing the first symptoms of the disease. In saying one per cent, of carbonic acid, I have taken a high figure, because it is known that, in health, the respiration of such an atmosphere for a long time is hurtful. How much more so in consumption, where the patient, by reason of the imperfect play of the lungs, is already taking in too little air! “In large cities, and even in small towns, it is next to impossible to get a constantly pure air in inhabited houses, for houses are built according to false notions of comfort. ‘What a nice cozy room,’ is a common expression applied innocently to every place where the greatest care has been taken to make an air vault, without a ‘draught’, and all ready for being charged with invisible impurities. “In a cozy room, the consumptive is bound never to live, nor in any room indeed for great lengths of time. So long as he is able to be out of doors, he is in his best and safest home. In the fields, on the hills, wherever the fresh air vivifies, where plants look most vigorous, and animals frisk about in the joy of health, there will the consumptive draw in his choicest medicine, there dissolve and throw off most freely the germs of his disease, and there repair most easily the tissues he has lost. “The inclemencies of the weather may tempo­rarily, it is true, prevent the patient from his out­door existence. But even these inclemencies are not so much to le dreaded as confinement in a house. I had occasion, some time since, repeatedly to remark, that if, from a few days rain, the consumptives under my care were confined to their homes, instead of being able to take the daily out-door breathing always prescribed, under such circumstances the aggravation of symptoms was always marked and universal. The appetite fell off, the debility became greater, the mind was less buoyant, the local mischief increased. The patients, too, previously accustomed to a full dose of the air food, were not ignorant of the cause of these changes, for reduction in air is felt as quickly as reduction in common diet. Seeing these evils, then, I have lately thrown off the alarm about bad weather, and have ordered every patient to seize, on an inclement day, each gleam of sunshine, for the purpose of getting out for a breath of fresh air. The result of this practice has been most gratifying in all cases where the courage of the patient has admitted of its application. “Dr. Jackson, in speaking of out-door life, in much the same terms as the above, dwells very properly on the necessity of securing for this plan the confidence of the patient. The treatment ‘should not be done rashly, but boldly’. If possible, ‘the patient should be made to have faith in it; for without this he is not likely to pursue it as far as he can, and then he will not derive from it all the benefit which it can afford.’ This is the fact; but the difficulty is at once got over if, under favourable conditions, the invalid can be induced to try the measure for a few days. Once tried, there is no fear, in the majority of cases, of its being given up, except in instances where the disease is too far advanced, or where, from the poverty of the patient, the pursuit of a sedentary occupation must needs be followed, even to the last days of existence; for the benefit derived from the proceeding is so plain, the debility is so much better borne, the relish for food is so much more markedly felt, the nights are passed with so much less of restlessness and cough, and with such an increase of sleep, that the sufferer soon instinctively feels the value of his instructions, and follows them out even more punctually than those which relate to the taking of medicines. “As much of the day, then, as is possible should be spent by the consumptive in the open air, and in places where the air is least impeded and least cor­rupted. When he is compelled to keep the house, the necessary precautions must again be taken for procuring a free admission of the atmosphere. No cozy room with a temperature at 70°, with every crevice closed, and with an atmosphere in a dead calm and laden with impurities, should be permitted. But the temperature should be from 55° to 65° Fahr. ; the fire, if there is one, should be in an open grate; and by perforated panes in the windows, and a free chimney vent secured by an Arnott valve, the freest possible current of air should be kept circulating through the room. If the patient is cold, let him approach the fire, but let him not labour under the popular and fatal error, that the way to obtain animal warmth is to shut out the air and roast the body. The heat of the body is made in the body itself, by virtue mainly of the oxygen supplied in the air; and as the body absorbs external heat with great diffi­culty, it would be as wise to attempt to give warmth by fires, hot bottles, and hot air, to a man who is not inhaling a due amount of oxygen, as to attempt the same process on a marble statue. In a word, ex­ternal heat is useful only in preventing the too rapid radiation of animal heat from the surface of the animal body. Alone, it cannot supply heat; but when a wholesome air is inspired, it can secure the retention of the heat that is manufactured in the animal furnace. “I spoke a moment ago of the open fire-grate. This is an essential for the room of the consumptive. Stoves of all kinds, heated pipes, and, in a word, every mode of supplying artificial warmth, except that obtained by the radiation from an open fire, is, according to the facts which I have been able to collect, injurious. It is injurious, because by such means the air is made too dry – an objection much less applicable to the open fire. If compelled to live in a room heated by a stove or by hot water pipes, or if the air in a room heated by an open fire be too dry, as may occur during north-east winds, the consumptive patient should meet the difficulty by allowing the steam from boiling water to be diffused through the apartment. I have known a patient to be kept awake with constant dry cough during the whole night, from what seemed, in great part, the dryness of the atmosphere, and have been able to afford relief by the simple suggestion named above. The symptom which I have most commonly seen elicited in the phthisical, by the inhalation of an unnaturally dry air, is haemoptysis, a symptom brought on possibly by the constant cough which the dry air excites. This effect, in a minor degree, will, in fact, appear in some cases without any actual deposition of tubercular matter under the influence of the cause just described. A gentleman whom I knew, and whose lungs were free from tubercle and other organic dis­order, was constantly annoyed and troubled with slight attacks of hacking cough and blood-spitting. He was at a loss to account for the cause. At last he detected that the attacks always commenced when he was at work in his study. With the idea of being very warm and comfortable, and ignorant of the nature of animal heat, he had introduced, into a small room a large Burton’s stove. To a stranger entering that room when the stove was in action, and the doors and windows snugly closed, the heat and dryness of the atmosphere would have been at once oppressive; but he, a close student, and constantly occupying the room under such conditions, had become accustomed to it as regards external sensation, but caught the mischief effectually in the chest. The cause of the symptoms being explained, the stove was abandoned, and the open fire-grate was again resorted to; the cough and blood-spitting at once disappeared without the administration of any medicine. A few weeks afterwards, thinking that the stove and the cough might only stand in the position of coincidences, our student re­sumed the use of the stove; and what is more, resumed also, as an effect, the cough and the blood-expectoration. This time he became assured that the stove and cough stood in the relation of cause and effect. The cause was once more removed, and ever since he has remained free of the effect. “The temperature of the air in the room of the consumptive should range from 55° to 65° Fahr., and he himself should learn to observe by the thermometer that he is living in an air of this degree of warmth. Bennett’s shilling thermometers answer for this purpose admirably, and come within the means of the poorest patient. To carry out the views thus suggested by Dr. Richardson, free ventilation, as means of insuring a good supply of pure air indoors is imperatively necessary; the point next in importance is daily exercise, and that in all weather. Walking exercise is the best of all, if the strength permits, – if not, riding on horse­back will be-the best substitute for the invalid. The beautifully varied character of the surface of the ground about Aspley, in which hill and dale are so combined, furnishes every attraction and inducement to pedestrian exercise. The contiguity of Aspley Wood, with its pine-sheltered walks, offers in all weather protection to the invalid from either the rough­ness of the wind in winter, or the heat of the summer sun. These peculiarities, combined with the dry absorbent surface of the soil, furnish the requirements of healthy exercise, at all times of the day, and in every season of the year. Returning to Dr. Richardson’s essay, I would add one or two more quotations from it. “The value of exercise is threefold. First, it checks waste of muscular structures, for muscles left inactive undergo a consumption, without any necessity for lung disorder. Secondly, it diverts the blood from the lungs, causes a more brisk circulation through them, and a more free distribution through the system at large. Thirdly, it induces a more free respiration; more oxygen is taken into the lungs, the body is restored to its vital purposes more surely, and, just in proportion as this restoration is effected, so is the restoration of disordered function and of disorganised tissue. “In the performance of muscular exercise let the consumptive never encumber himself, or check the free movements of his body by strappings, loads of clothes, or carrying of weights, and the like. These are but tasks; they lead to unequal exertion in special sets of muscles, and such inequality of expenditure is that which is to be avoided. The treatment of consumption in a hospital is objectionable, again, in regard to exercise. Of what use to the consumptive is an acre or two of airing ground confined at the back of his hospital I let him be certain that where the gardener cannot make roses bloom, and peach trees blossom, no doctor can give to the anaemic cheek a permanent colour, to a lost function its uses, or to an impoverished body its once healthy power. “The Reports of the Irish Census Commissioners, already noticed, add, however, more force to the rule I have laid down, than any facts as yet published. The mortality from consumption in the spring months, for ten years, is there shewn to be twenty-two thousand more than in any other season. Why? Not, it is clear enough, because the months of spring are hotter than those of winter, or colder than those of summer; but, because, in this transition season, the variations of climate are more severely felt. It is the peevish April day’ that tells, in its numerous changes, its cold mists, its warm sun, its heavy showers, on the constitution of the consumptive man. “The dress of the consumptive patient should be adapted to equalise the temperature of the body. Instinctive sensations both in health and disease naturally dictate the above rule. But it is too commonly the fact that these sometimes are disobeyed. Some persons think it a hardy, and therefore a bene­ficial plan to dress lightly in all weathers. Foolish mothers send out their children in midwinter with bare legs and chests; young ladies go to balls and evening parties with the upper part of their dresses open. Others go on a different tack; they must at all seasons be smothered up in flannels and outer dresses, layer upon layer, carrying in short as much cloth as they possibly can, like a fast sailing cutter. Such persons on both sides evidently misunderstand the uses of clothes, or think them only ornamental appendages. But clothes are useful, in a sanitary point of view, simply for equalising temperature, i.e., for preventing more or less the escape of the animal heat as it is radiated from the external surface of the body. “For the consumptive flannel clothing is always required, and it should cover the whole of his body. The poorest man or woman may avail themselves of this, for it matters little what the outer garments are if the under ones are non-conductors of heat. The thickness of flannel must vary according to the sensations; as far as is possible, the feeling of absolute cold ought to be at all times prevented. The consumptive should sleep also in flannel; not in the dress worn during the day, but in a flannel gown. The shoes worn should be thick, whole, and com­fortable. All sorts of absurdities in the way of hair skins, warm plaisters, and the like, placed specially on the chest, are useless; and the plaister is worse than useless, since it checks the function of the skin over a considerable surface, and is dirty. “A common practice in the selection of clothes is to imagine that the weight of a garment conveys an idea of its warmth-sustaining power. This is an absurd error; for what is warmer than a German coverlet, which is simply a silk bag half filled with down, and nearly as light as air? For consumptive persons, this mistake about heavy clothing must be carefully avoided; they may safely trust to flan­nel, and may then walk out as warm as they can be made by clothing, without the risk of being wearied from the burthen on the back before they have got half a mile from home. “Is it necessary to more than mention those abominations of female attire, corsets? I hope not. However, as some young ladies are still led to imprison themselves in them, it may be well to tell the mothers of such, that to screw up a consumptive child’s chest with stays, is only equivalent to preventing the act of breathing by the mouth, because it is performed with difficulty by the nose. “It is obvious that to the consumptive man nothing can be more important than that his income should exceed his expenditure; and it is quite remarkable how much alleviated all the symptoms of consumption are when the balmy god is appealed to not in vain. The rule I have laid down regarding the hours for sleep is imperative for many reasons. First, because in all seasons the actual amount of rest required by the natural man is pointed out with the precision of an astronomical law by the course of the sun. In midwinter men require, for physiological reasons, more sleep than they do at midsummer, and just so much more as is indicated by the difference of night in these two periods. Observe how all animals, left to their own natural instincts, obey this law. Secondly, in our present artificial mode of life, we have to extend the day by the invention of artificial lights. But whenever a man shuts himself up in his closet, and makes a little sun out of his gas lamp or candle, he is feeding that lamp with a part of his own breathing store – the air around him. Worse still, the candle can, no more than the man, live alight without exhaling carbonic acid gas, and thus vitiating the atmosphere. A pound of oil burnt in a lamp produces, in burning, nearly three pounds; and every cubic foot of coal gas, rather more than a cubic foot of carbonic acid. The evil effects of carbonic acid on the lungs have been already described. Thirdly, as an artificial light is, by the mode in which it is produced, of necessity injurious, so, on the contrary, the pure sunlight is of the greatest worth in the acts of vitality. What sunlight does in a physiological way is undetermined; but its general influence has long been known and recognised. Plants banked up from the light become blanched, and human beings kept for a long time in dark abodes become the victims of ansemia and scrofula. “Thus, to fulfil the natural law regulating the times of sleep, to escape from the artificial light, and to obtain the advantage of all the sunlight that can be secured, the consumptive patient should make the sun his fellow workman. “During the acts of sleep many physiological modifications occur, which it is important to notice. In the sleeping state the number of respirations are diminished and the circulation is more feeble; as a result, the temperature of the body is reduced. These facts supply two indications, viz., that a free supply of air must be given to the sleeping man, and that he must be well enclosed in woollen material, so as to husband his animal heat. The profuse per­spirations, which form so marked a symptom in the phthisical generally, come on during a profound doze, and the patient wakes to find himself bathed in moisture. It always occurs to me, that this pro­fuse action of the skin is but secondary and conse­quent to a diminished exhalation from the lungs. At all events, after having tried oil inunctions, sponging with acid solution, and the administration of various astringent remedies, with varying success, I have found no plan so efficient for preventing these perspirations as that of supplying a constant current of pure air. This system does not, of course, interfere with the application of other remedial measures, but it should stand foremost. Cough also, so common a disturber of the night’s repose, is most effectually treated on the ventilation principle. For an impure air excites cough by its direct effect on the mucous surface of the air passages; and further, as before shown, when air laden with carbonic acid is inhaled, the chemical changes of respiration are checked, the pulmonic circuit is retarded, the heart becomes embarrassed, and congestion of the lungs is an inevitable result. This is another exciting cause of cough and expectoration. “The occupation of the consumptive patient should be suspended if it is indoor or sedentary; but a certain amount of outdoor occupation may be advantageous. This rule is one which, in the majority of cases, is most difficult to carry out, though second to none in importance. There is, in a word, no exciting cause of consumption so general as an indoor occupation. “In the case of parents having children of a consumptive tendency therefore, the greatest care should be taken to obtain for them outdoor employment. But here a serious delusion commonly comes into play. If the child is weakly, the fond parent urges that it is unfit for hard labour and for out-door vicissitudes; so it is sent to a tailor or shoemaker, to a clerk’s office, or draper’s shop, or to some occupation of an indoor character; by this grand, ignorant, and fatal mistake, it is added to the list of the two-thirds who swell the table of consumption cases. ”Almost all occupations implying muscular exertion out of doors, without undue exposure to wet and damp, may often be pursued by the consumptive as long as possible, and with advantage. The pursuit of some occupations is better exercise than simple walking, since it keeps the mind occupied and in healthful tune. “I remember a patient once who, in the first stage of consumption, insisted on coming into town each morning from a considerable distance in the country, to look after his business, and to return home again in the afternoon. It mattered not that the sky looked threatening, for he was not afraid of such a trifle, although, he knew that the plague spot was in his breast. When expostulated with by friends (and, I am ashamed to say, by myself, for I was ignorant then of the truths I now inculcate), his reply was, ‘My brothers and sisters have all died of consumption; they were coddled up, nursed, carried about, confined to bed, and bound in the cords of helplessness by the kindest hands, to the satisfaction of the doctor and of all concerned. But they soon died. I hold the germs of the same disease, and I too shall die; I know it; but my course is different, for I have made up my mind to die in harness; I have kept at my business in resistance to all entreaties, and I am the only one of the family left.’ The plan adopted by this man was right; he bore the brunt of the disease for months, and, to the best of my knowledge, he is alive, and occupied still. “I recommend every consumptive, whose occupation is in the open air, to take to heart the motto of this man, to make up their minds ‘to die in harness’. They will live the longer for the resolution. “Cleanliness of body is a special point in the treatment of consumption. But little need be said to enforce this rule. In health there is always a mutual understanding and a kind of partnership between the skin and lungs. In consumption moderate action of the skin is a relief to the lungs, and as such ought to be encouraged. This is best attained by keeping the skin clean by daily ablution. Let the consumptive boldly take his bath as each morning comes; not a shower bath, not a cold bath, under any impression that water cast on the body in a certain fashion, or at a certain temperature will give strength, but a tepid cleansing bath, with the temperature from five to ten degrees above that of the body. There is no occasion to stay in the bath a moment longer than to obtain a free ablution; then the patient should rapidly but effectually dry himself all over with a rough towel, and dress with the flannel garment undermost. If oil inunction has been used overnight, a little liquid ammonia may be added to the bath water, and a soap will then be made on the body during the ablution. “The clothes of the patient should be kept as clean as possible, and the under clothing should, properly, be changed every second or third day. “The diet of consumptive patients should be ample, and should contain a larger proportion of the respiratory elements of food than is required in health. The appetite of consumptive patients is very capricious, and daily grows more so if it is not sharpened up by exercise. When the food taken is not applied to the purposes of nutrition, it is better left untasted; for otherwise it lies undigested in the alimentary canal, and sets up a serious train of dyspeptic symptoms, nausea, and diarrhoea. Kind friends often, with the most provoking and mistaken good nature, thrust upon the consumptive relays of the most improper food, because the necessity for nourishment is so obvious. But the fact is that, when the lungs are acting indifferently, digestion cannot go on actively; since, as Arbuthnot well observed, respiration is ‘ the second digestion’. Hence the quantity of food taken by the consumptive person should be small at each meal; but the meals may, if the sensations of the patient require it, be more frequent than in health. Animal food is an absolute necessity, and of all animal foods, mutton is the best. Fatty and oily foods, which constitute the respiratory class, should predominate, and fresh butter, with bread, may be taken almost ad libitum, so long as it agrees with the stomach. Cream, too, is very excellent; and the northern luxury of curds and cream is well suited to these cases. Milk, whenever it suits, is advisable as a constant beverage, and good cow’s milk, new, answers every purpose; at all events, there is, as far as I can gather from cases in which I have seen them tried, no such specific virtues in asses’ milk and goats’ milk as some have supposed. Tea is nutritious, and may be taken in moderation with perfect safety. Fresh vegetable diets should not be omitted; and fruits, especially roasted apples, are always admissible, except in instances where they excite irregular action of the bowels. The Iceland moss has had a great reputation, as have jellies of different kinds ; but these often are slow in digestion, and they have no specific value. “In the selection of these various articles of food, the safe plan is to allow the instincts of the patients to guide the practice. These instincts rarely misdirect; but if they are disobeyed, the results are too often disastrous. The one independent rule which should be impressed on the patient by his adviser is that given above, namely, to take in as much of the respiratory foods, especially the fatty and alcoholic foods, as he feels consistent with his desires and with prudence; for, as he lives in some measure in a per­petual winter, he, like the Esquimaux, calls the more freely for the supporters of animal combustion. As regards times of eating, let the instinctive feelings again have their way; when hunger calls, let it be obeyed, at whatever season; and when the stomach says ‘enough’, let that order be attended to with equal punctuality. “The medicinal treatment of consumption should in the main be of the tonic class. In consumption, the medicines given should be made to assume the characters of food as much as is possible. Cod-liver oil, though used as a medicine, is essentially a food; and in small doses, often repeated (from one to three drachms for a dose), its value is, to my mind, unmistakable. Steel and quinine are invaluable, and, in their way, are also a kind of food. Opium, so absolutely demanded at times to secure rest, has the disadvantage of interfering with nutrition. But no remedy, however beneficial, should lead us to neglect attention to those general and hygienic measures by which the constitutional health is promoted and sustained, or, in other words, the great functions of circulation, respiration, digestion, absorption, and excretion, are promoted. Mention has so often been made of these measures, that it is needless to specify them again; and, as it will be of doubtful utility to the general reader, I shall merely state that, according to Dr. C. J. B. Williams and other eminent pathologists, cacoplastic (diseased, partly organ­ised) plasm and aplastic (diseased, or non-organisable) deposits are really absorbed, even after they have formed a part of the corporeal fabric, and given rise to both distressing and dangerous symptoms. “That such absorption does take place, is indisputably proved by the changes in chemical composition, as well as in physical condition, that these deposits undergo in process of time. The most salutary of these changes, and the absorption of the most injurious part of the deposits, are promoted by as free and active a circulation through and near the affected part as can be carried on without inducing irritation or hyperaemia (too much blood). Hence the utility of regular exercise, and of frequent friction of the surface in the vicinity of the seat of the deposits, sometimes aided by rubefacient applications or salt-water aspersions. The more active circulation thus excited promotes the gradual solution of the deposits, chiefly by the oxidating current of arterial blood that it directs through their neighbourhood.” I might adduce many other powerful evidences from this able work, but in order to give the reader a clearer view of what I consider to be the most efficient mode of treatment in consumptive cases, I prefer taking an extract from a spirited pamphlet, by Mr. Bodington, (The Treatment and Cure of Pulmonary Consumption, on Principles Natural, National, Scientific, and Successful. by George Bodington, Surgeon. London: Longmans. 1840.) which fell into my hands as far back as 1840. “In warm climates,” says Dr. Copland, “and even in many temperate countries, during warm seasons, places on or near the sea-coast are more productive of insalu­brious exhalations than inland districts, owing not merely to their being more nearly on a level with the sea, and subjected to a denser and more moist atmo­sphere, but chiefly to the circumstance of the soil in such localities being more deep, rich, and absorbent, more liable to inundations from heavy rains or swollen rivers, and from the sea itself; more fertilised by the decay of animal and vegetable bodies; and hence more pro­ductive of the elements of unwholesome exhalations, when their extrication is favoured by a hot sun, and their retention and accumulation in the air are promoted by its more constant and greater humidity. “The currents of air that, during the heat of day, pass from the ocean more or less loaded with moisture, return to it in the night, charged not only with humidity, but also with terrestrial emanations; thus rendering places situate in the vicinity of the sea, and nearly upon the same level, more insalubrious than the elevated districts inland. “A winter residence is of the greatest importance in this (the early) stage to the patients in cold or tem­perate climates, for that residence should be selected which will admit of regular and daily exercise in the open air. But this is not the only consideration by which we ought to be guided. Elevation above the surface of the sea, a situation near the level of or close to the ocean, or removed at a distance from it, and frequent or prolonged voyaging on it, are severally topics which require to be duly considered. “Elevation above the surface of the sea, especially in warm climates, and when dryness of air is attained by elevation, is beneficial. Even in temperate climates, where elevation is conjoined with dryness, the diminished temperatures which results is not so injurous as generally believed. The cold of Canada is by no means injurous to the consumptive, owing to the dryness of the air being great in proportion to the lowness of temperature. If such residence admits of exercise in the open air, it may be salutary, although a warmer air and an exemption from sudden atmospheric vicissitudes may be preferred. The only question connected with residence that remains to be considered is, whether preference should be given to a sea-coast of to an inland locality. This is a difficult question to answer; and, judging from the indisputable advantages derivable from sea-voyaging, and the frequent recommendations of places on the sea-coast by modern physicians as winter residences for the consumptive, it may be inferred that these places are actually the most healthy. But this inference is neither logical nor practically correct as respects phthisical cases. The benefit derived from voyaging depends chiefly upon uniformity of temperature and the motions of the vessel, aided by the influence of a pure sea air on the digestive and assimilating functions. Residences on the sea coast furnish only two of these elements of benefit in an imperfect manner, but they are altogether deprived of the third, and what appears to be the most important. We must, therefore, refer to the results of observation for a decision; and as far as my experience enables me, I may state, where two localities, one inland, the other on the sea coast, possess equal advantages as to dryness of the air; as to annual, monthly, and daily ranges of temperature; and as to vicissitudes of weather, and facilities for out-door exercise, that the inland situation should be preferred. If the reader has carefully followed me through the various causes of impaired health as laid down in the foregoing pages, he cannot fail to see that Aspley Guise, as a residence, is pre-eminently calculated to furnish all the requirements mentioned as necessary to removal of disease and the re-establishment of health. Its claims are dryness of soil, equability of temperature, absence of fogs, small annual fall of rain, purity of water, moderate elevation above the sea level (between three and four hundred feet), and withal, sheltered groves for outdoor exercise, so much insisted upon by Sir James Clark, Dr. Copland, Dr. Richardson, Mr. Bodington, and others. Further observations made since my first pamphlet was published more than confirm the views I there expressed, and spontaneous testimony from medical men well acquainted with the spot has been most freely offered to me. Numerous persons have found benefit from residence in Aspley, and are living testimonies of the truths I advance. These will enable the profession and public to more correctly estimate what I have said by way of proof that Aspley. independent of its rural beauty, etc., does fulfil all requirements necessary for the restoration of impaired health generally, and more particularly in the affections previously enumerated. With such claims upon the attention of the public, and while offering such advantages to that class of sufferers who by their numbers appeal powerfully to our sympathy, it is to be regretted that this village and neighbourhood possess such limited accommodation, that, like the waters of Tantalus, they may be said to mock the afflicted with the prospect of blessings which they forbid so many to share. Let us hope such a state of things will not be allowed to continue much longer. Building sites can be readily obtained either by purchase or lease, and thus in one instance the capitalist might benefit others, while keeping strongly in view “the charity which begins at home” by securing in good rents a handsome return for his money. Since the first pages of this edition were printed, I have as­certained from a lady living in this neighbourhood, that the Osmunda Regalis is to be found in Brick Hill Wood, which is a continuation of Aspley Wood. Hence Abbot’s assertion, that it is found in Aspley Wood, may be correct. It is, however, very remarkable, that the “Flower-crowned prince of English ferns” should be found in a locality which, as we have stated, possesses so few varieties of the same genus. Aspley Guise is forty-eight miles from London, or about one hour and a half by railway from Woburn Sands station, which is three-quarters of a mile distant only from the village. The best route is per London and North-Western Railway; though some persons may select the Great Northern, via Bedford . Visitors from the west of England will find the Great Western, or Oxford , Worcester , and Wolverhampton, most convenient, leaving that line at the Handborough junction to Bletchley, then by the Bedford branch, a distance of some six miles, to Woburn Sands station. There is as yet only limited accommodation in regard to apartments; and houses have been for some time in great demand. Good rents are obtained; it is therefore much to be desired that the attention of capitalists should be drawn to the facts, particularly as land can be purchased or leased in various parts of the village, commanding good views, and in every way desirable for building purposes. This circumstance, added to the fact of there being a large proportion of resident gentry in the village, renders the locality at once pleasant and desirable. OPINIONS OF THE PRESS ON THE FIRST EDITION OF DR WILLIAMS’S OBSERVATIONS ON THE TOPOGRAPHY AND CLIMATE OF ASPLEY GUISE. From the Bedford Times, November 8, 1806. “Seven years ago, ill health and its consequences induced me to relinquish a good connexion in Herefordshire, on the borders of Wales , in order to secure a residence upon a dry soil, and in a more southern part of the kingdom. While casting about for my future home, an advertisement of a small practice in the village of Aspley in Bedfordshire decided my choice; and thus a seeming accident made me first acquainted with this favoured spot. “I had always pictured Bedfordshire to myself as a bleak damp county; and, having but little knowledge of its geological strata, I was pleased to find that the village of Aspley was upon a deep though narrow line of the green sand formation; a circular range of hills, of moderate elevation, extending from Tring in Hertfordshire to the neighbour­hood of Biggleswade. From the Journal of Public Health, January 1857. “Dr. Williams has here given a very pleasantly written and interest­ing book. He makes out a good case for Aspley Guise as a residence for invalids, and shows that England has in herself the advantages which sick tourists seek abroad. “The mean temperature of Aspley Guise is 49½°, the range of tem­perature 8°; the annual fall of rain 19½ inches. The stratum is of sand; the water is good; and the mortality from fourteen to fifteen per thou­sand. Dr. Williams’s book may be perused with advantage by those who wish to select a residence, permanent or temporary, for the debilitated and consumptive. From the Association Medical Journal, December 20th, 1856. “The fact is now beginning to be recognized, that our own country possesses localities fitted for the sojourn of the invalid, especially the consumptive; and that the dismissal of such patients to foreign parts is often little or nothing better than sending them away to die. To bring under notice one of these favoured spots of England is the object which Dr. Williams has in view. “The mean temperature for night and day lies between 38½º in January, and 61½º in July; the annual mean being 49½°, and the mean annual range 8°. In the smallness of the range, Aspley is only exceeded by Pau, which has a range of 7 6-10ths. “Such being the hygienic condition of Aspley, Dr. Williams finds that, though neither it nor any other place enjoys an absolute immunity from disease, it yet enjoys a comparative immunity, and that the rate of mortality is below the average of a healthy rural district. From the Northampton Mercury, December 13th, 1850. From the Bedford Mercury, November 8th, 1856. “It has frequently struck us, that the lighter publications of the me­dical press in this country are more generally characterized by literary excellence than those of any other department at all professional. Dr. Williams’s pamphlet confirms our observation, and affords an opportunity of congratulating the country on the pleasing and valuable effects of that high standard of general education so long insisted on as a preliminary and groundwork of special professional study in England and Scotland . 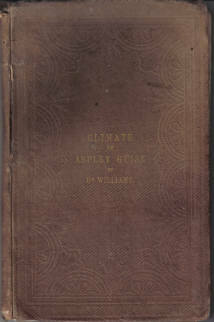 “The Observations of Dr. Williams are addressed to invalids, but they possess serious claims to the attention of all who, by the nature of their pursuits or the peculiarities of the situation of their own homes, are periodically reminded of the extremely fragile tenure by which they hold the lease of health and life. To us this pamphlet brings a special consolation; for the residents in this district of the county, are brought to feel, in the course of several years addiction to business, that even a goodly slice of the whole profits of those years might be advantageously expended in a trip to Hastings, the Isle of Wight, or even to Pau or Nice. But as the majority of the genus paterfamilias are remarkable for the patience and seriousness with which they will weigh objections to a long and expensive trip, we cannot doubt their gladness of heart when they learn by the pure, indubitable, intelligible evidence of figures, that a trip to Aspley, and a sojourn there – or, at any rate, a country house in that favoured locality – will answer quite as well as (and even a little better than) a troublesome, costly, perilous expedition to foreign countries. From personal experience, many of our readers will be prepared to welcome with thankfulness, but without surprise or suspicion of exaggeration, the laudatory testimony of a resident physician to the salubrity of Aspley Guise. Unless the usual course of such events is greatly altered in our own case, by force of superior intelligence, we shall be having all the world at Aspley for health, while we continue to waste time and money, and more than one moral quality that generally can ill afford to be wasted, in roaming up and down our own country, or in grumbling out a wearied and much-chafed life in strange countries. From the Athenoeum, August 1st, 1857. From “The Lancet”, June 12th, 1858. The principal parts of the body affected were the feet and ankles. He had, however, pains and soreness in the shoulder, back, &c. These pains frequently moved about, and were not always present; they were sometimes in the hands. His general health was unimpaired, though the feet were constantly swollen, with great turgidity of the bloodvessels, rendering them partly varicose. The ankles are nearly stiff, and have been so for about two years. This circumstance made walking extremely painful and difficult, and if by chance he stepped upon a stone or an unlevel surface, the pain was so great as to cause him to almost sink upon the ground. Amongst other remedies, I had tried to relieve him with colchicuin, alkalies, lotions, embrocations, &c., which were not of the least service, and thus the case was given up. Some time after this a benevolent lady in the village applied to me on his behalf to know whether or not the sulphurous vapour-bath used by myself would relieve him, to which I replied in the negative. However, as she very much wished a trial to be made, I therefore agreed to give him a chance. I must say that I had no idea that such a result could follow in a case so obstinate as his. The patient has a ruddy complexion, and is, no doubt, of an inflammatory habit of body. Here then is the clue to our success. The use of this sulphurous water has been of marked benefit in rheumatism, and when conjoined with the vapour-bath, or made the basis of the steam, no doubt it acts as a great purifier of the blood, and by the free perspiration induced relieves the system of many impurities, which, circulating in the blood, are deposited in the various tissues, particularly the muscles and ligaments of large joints, giving rise to painful contraction in the muscles, and impediments to free action when deposited about joints. Some persons may suggest that the potash, colchicum, &c were the principle agents of cure in this case. This, however, may be safely refuted by stating that it was freely given, and tried in all its forms for years, with no benefit; in short, the case was not relieved at all, except by the use of the sulphurous vapour-bath. While upon this subject, I must express my regret at the falling off in the use of baths generally. Doubtless, many obstinate cases which now fall to the care of quacks and other pretenders might have been cured by orthodox practitioners with the aid of baths. I look upon the vapour bath as one of our most potent weapons in most chronic and many acute affections, and skin diseases, especially those where dryness and great irritation exist. I have lately cured a very obstinate case of scrotal herpes, in a gouty subject, where dry vapour, lotion, ointment, and other remedies were of no avail. This case, however, will more properly form the subject of a separate paper. It should be remarked, that though upwards of three months have elapsed of trying changeable winter weather, the rheumatic case continues a good and perfect cure, no return of the symptoms having taken place, the patient being able to attend to his ordinary daily labour, and walk miles to and from his work. My vapour-bath consists of a small wooden chamber, about four feet by three, and five feet high; it has doors which open and close like a cupboard; it has also a perforated zinc box fitted in the top, closed by a lid, which, when partially removed, acts as a valve to allow the exit of superabundant steam; this opening admits of water being poured from a large jug or other vessel over the patient while sitting in the vapour below. There is also a small zinc box, with a perforated lid fitted to the bottom of the bath, this receives the condensed steam or shower, and is emptied by a small tap underneath the floor. It is altogether very complete and inexpensive; and I shall fuel much pleasure in showing it to any of my medical friends, should they think it worthy of examination.